A one day Instructional Camp led by Koepplin Kicking Director and Former NFL Kicker Chris Koepplin. It will be a great way to jump start your off-season training and knock off the rust from the long winter. With a Focus on teaching the Fundamentals of Kicking & Punting, this camp will help you improve your technique and develop consistency to perform your best this fall. - Learn the Koepplin Kicking Method - Feel the confidence of "Effortless Power" and overcome the frustration of "Powerless Effort" to create an Efficient swing that is Consistently Accurate and Reliable when it matters most. Now we can help you improve your technique wherever you are throughout the country. With increased parity in college football, one would think kickers would be among the most sought after recruits. Not so for many of the top high school specialists who are typically among the last to secure an opportunity at the next level. We recently consulted with Compete Kicking Network associate Lee McDonald of Special Teams Solutions, to discuss this recruiting reality. Unlike a running back or linebacker, schools do not recruit a kicker every year according to McDonald. This is mainly due to the fact that kickers are not utilized elsewhere, such as a back-up on offense, defense or in coverage on special teams. FBS (Division IA) schools typically only reserve 2-3 scholarships for a kicker, punter and snapper while many FCS (Division IAA) only allot 1-2 scholarships that are often divided among several players. College Recruiting is a very complicated subject that many young athletes and their parents do not completely understand. There are many misconceptions as to how the entire process works. Receiving a scholarship offer from a college program is statistically very rare. Many high school football players have excellent careers but are not able to continue on to play in college. Here are some statistics that help explain the reality of the situation. There are certain "Recruiting Realities" that are unique for specialists that make the entire experience very different from that of players at any other position. Kickers and Punters are not the priority when it comes to recruiting and for many schools, a complete after thought. That's why when you are a specialist it is critical that you take ownership of the recruiting process and make sure you take your fate in your own hands. Excited to announce we will be hosting an Indoor Mini Camp on Sunday, March 16th at the LI Sports Hub in Syosset, NY. The off-season is not as long as you may think, we only have six months before fall football camp. What you should be thinking about right now is what you can do to get better. Join us for perfect indoor conditions and a fun learning atmosphere for everyone. We will conclude the camp with a friendly competition with prizes to the winners. When you choose to train with us we know that you are dedicated to your craft and serious about improving in all facets of your game. We want to help you achieve everything you are capable of and make sure you know that through hard work, dedication and a belief in your self anything is possible. 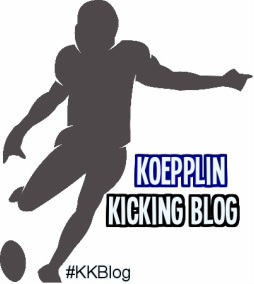 The Koepplin Kicking Philosophy defines what we are all about. thinks he Can't are Both Right."